Q: Are the fees going to certain charities? If so, I think lots more collectors will be eager to help even more. A: The Outdoor Dream Foundation and Liberty University Baseball. Q: Some collectors may have worried that the $1 charge was due to you getting tired of fan mail, signing and collectors? A: No, that is not true. I wish I would have thought of this years ago and would have been able to raise a lot of funds for different charities. 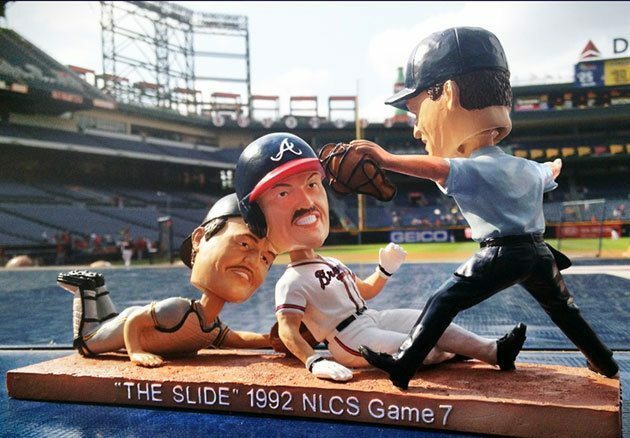 Q: Congratulations on being a bobblehead and your 20-year anniversary of sending the Braves to the World Series. When was the first time you heard those immortal words: WHEN SID SLID? 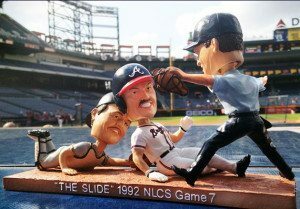 A: ‘Sid Slid’ was given right after the event took place. Q: You’ve pursued excellence all your life. Did being a Christian help you be a better player, or did being a player help you be a better Christian? A: I think both. Being a christian certainly gave me the peace to understand the significance of me being on this earth, but the struggles and victories of baseball gave me the chance to use the faith to trust Him more. Coming Wednesday: What every fan letter and autograph request should include! I think this is a fine idea. I certainly like getting free autographs, but I don’t have a problem with paying for them, especially if the funds are going to a good cause. Many times I balk at paying a signing fee, because I don’t know the reason why (not that it is really any of my business). In this instance, I understand Mr. Bream’s rationale and have no problem with it. I’m just glad that he apparently has not tired of the attention that he gets from us fans of the game and autograph collectors.